Obama Imposes Sanctions On Venezuela, Invoking Emergency Powers : The Two-Way Citing an "erosion of human rights guarantees," President Obama issues an executive order imposing sanctions on members of Venezuela's military and intelligence services. President Obama says new sanctions will target Venezuelan figures who have helped repress human rights. 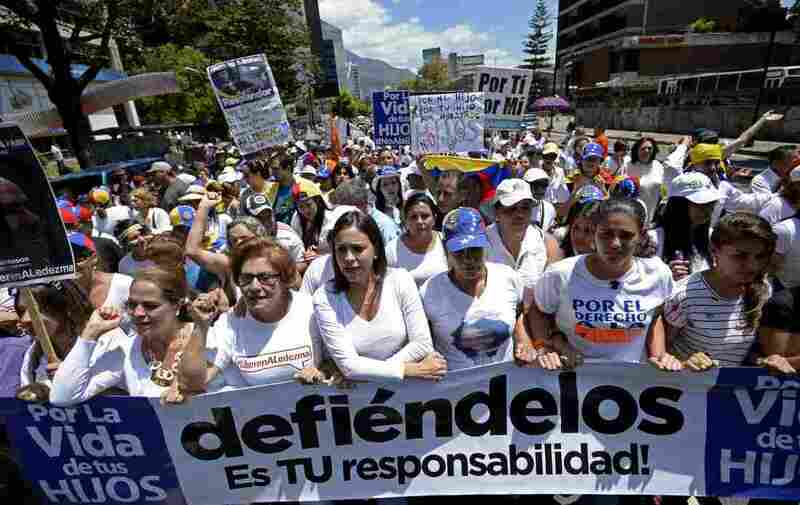 Here, opposition leader Maria Corina Machado (center) marched with opponents of President Nicolas Maduro in Caracas to mark International Women's Day. Citing an "erosion of human rights guarantees" and corruption in Venezuela, President Obama issued an executive order Monday imposing sanctions on members of the country's military and intelligence services. The White House says the executive order builds on the Venezuela Defense of Human Rights and Civil Society Act of 2014, part of a response to a violent crackdown on government protests. Obama also invoked his emergency powers to declare "a national emergency with respect to the unusual and extraordinary threat to the national security and foreign policy of the United States posed by the situation in Venezuela." U.S. relations with Venezuela are currently in tatters, even as it attempts to forge new ties to Cuba. As NPR's Parallels blog reported Sunday, "President Nicolas Maduro accuses the U.S. of plotting a coup against him, and is expelling most U.S. diplomats from Venezuela. He is also demanding that Americans secure visas to enter the country." President Obama's executive order freezes the assets of seven individuals, ranging from Gustavo Enrique González López, the director general of Venezuela's national intelligence service, to the head of Venezuela's Bolivarian National Police, Manuel Eduardo Pérez Urdaneta. Like several others on the list, the two men are charged with being involved with "significant acts of violence or conduct that constitutes a serious abuse or violation of human rights." The White House's list also includes prosecutor Katherine Nayarith Haringhton Padron, who is accused of charging members of Venezula's opposition with crimes such as "assassination/coup plots based on implausible — and in some cases fabricated — information."